I have a strange habit of collecting links to useful online resources and publications. The reason I call it strange is that I never, ever have a look at them again as they are far too numerous. Yet, last December I decided to unclutter at least one of my super folders. My choice was a collection of links on writing business emails for touching leads, prospects, and current direct clients. Quite a bit of work I should say! But now I am happy with the result as I have 10 files on different aspects and stages of handling emails: from Getting Prepared to Grand Merci. Below I summarise basic best practices I found useful after processing dozens of articles. To find the right contact person with their contact details is not always a straightforward process. You can search LinkedIn for names and titles to know who is who (for instance, the name of the company + marketing). We can often find contact details of marketing people in corporate press releases and conference presentations. If you know the name and need an email, try googling it with a search query name + “email”. Or go ahead with googling a sample email like *@abc.com or “jane smith” @abc.com where abc is the company’s name (works well for me!). You can use services like Data.com Connect. In any case, make sure you know at least something about your contact person before you write to them. Try to find out more details on your contact person (social networks including LinkedIn will come in hand here): their interests, websites they read, topics they write about. If you find a shared connection, you can ask to introduce you or to include that person’s name in your email. What other common points do you have? It can be a professional aspect like an article written by the contact person or an industry event you are both going to attend. It can be as simple as where they live or what they like. Or it can be both. Social media offer tons of useful info. Go creative: subscribe to the newsletter of the person/company you want to connect with. Reply to the first email they send. That’s it. Think of other non-standard contact channels. Can you take some of their content and translate / repurpose for social media or your blog, with their permission? Analyse the information you have. Is it enough to draw a meaningful connection? If you can’t think of a good reason why you’re reaching out, don’t. Don’t treat business emails as cliches. Take them seriously even if it means to reduce your outreach efforts by focusing on key contacts. If you know something you have in common with your reader, to be sure to mention it. If you can’t relate personally, relate through the service they need or you are sure they need. Important: no hard sell. First emails are not about closing sales but about starting a conversation to make a prospect want to hear from you. Find ways to relate your email to something that is top of mind to the reader. Are they expanding to the market you know, or did they recently launch something? If you can tie your message into that, it has better chances to attract attention. 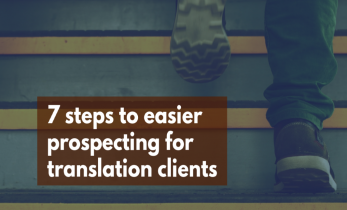 Offer something for free like a free translation sample you’ve prepared beforehand. Or perhaps you have some resources or an insight to offer. Include one or two links to additional articles or attach a more in-depth resource on issues you’ve already brought up. You can ask about the prospect’s needs and their problems to see if you can help. What makes your service better, faster, or more convenient than others? Dig into why you matter and be sure to share it with the reader. Or try short prospecting emails like “Are you the right person to talk to about offering my services to your company?” Your email should still include details to make it relevant. If you’re asking someone to take a chance on you, build credibility by referencing your professional background, specialisation or brands you’ve worked with. Include testimonials, accomplishments, years of experience that make your background unique. Convincer phrases are another type of social proof. Being experienced and well versed in your specialisation means you can communicate problems and results in a way that matters to your prospect. Go ahead and write down all your thoughts. Don’t think of grammar, punctuation, or structure yet. If that is even hard to accomplish, converse with yourself orally just to get your thoughts out. Actually, it’s a good idea to use speech recognition to write a first draft. Good business communications are a conversation. Try shorter phrases and sentences. You’ll have a better chance of producing a concise, well-written piece. Make it not longer than 65 characters and try at least five variants. Rewrite your draft making sentences and words simpler and shorter. What you want : define the problem. What are you trying to solve? Be direct. Put the ask up front and early, and again in the close of the message. Put the action, request, or most important information in the first line of the email. In essence, write your email backwards. Don’t wait until the end of your email to ask your question or to make your request. Remove weak words. 5 common words that make you sound less confident in emails: just, kind of, actually, hopefully, sorry. Remember that many people read emails in “text only” or use an email program that might break the format. If you want a response to the email, say so. If you want a decision made, say so. If you want the recipient to contact somebody else, say so. Be direct. Explaining why you want someone to do what you ask, no matter how ridiculous the reason, increases the chances they’ll do it by more than 50%. Then proofread again after changing the font size. This shifts the words and forces you to read what you’ve actually written and not what you remember. Triple-check that all included information is correct. Your prospect might forgive a typo, but better not to mess up their name, their company’s name, your name, your company’s name, or their job title. That’s it! You are ready to press SEND. 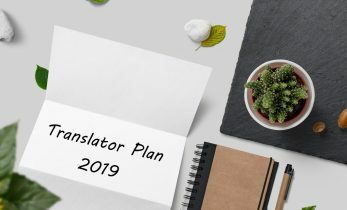 Should Freelance Translators Have Business Cards? Business cards, relevant or not in 2019?